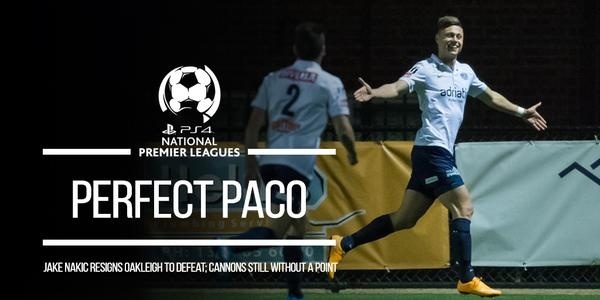 Oakleigh still without a point after loss to Paco. Pascoe Vale Soccer Club has seen off Oakleigh Cannons 1-0 under lights on Friday night at CB Smith Reserve. The lone goal came from former Dandenong Thunder striker Jake Nakic in the 28th minute to reward Pascoe Vale’s first half dominance. Nakic was involved early with the first opportunity of the game for the home side. He ran in behind the Oakleigh defence with only goalkeeper John Honos to beat, but came off second best against the sweeper-keeper. The pressure would mount onto Oakleigh when club captain Joseph Youssef swung in a cross for Davey Van’t Schip, but the Dutchman wasn’t able to redirect the header on target. In a game lacking of clear-cut chances for Oakleigh, one of the few came from forward Evan Christodoulou. He found space in the penalty area after a corner into the box, connecting with a neat volley that was comfortably saved by Paco goalkeeper Alex Pavildis. The lone goal in the game came after a lovely worked exchange between Youssef and Nakic. Paco captain Youssef slid through a ball down the line on the edge of the penalty area, leaving Nakic in an acute angle to shoot from. The front man was left with it all to do close to the byline, but steered his shot into the roof of the net. Pascoe Vale carried its first half form into the second half with a stronger emphasis on defence, sitting deeper in the second period with a view to counterattack Oakleigh’s shaky defence. Oakleigh’s wayward passing game hadn’t been fruitful, with a lack of urgency and movement in the front line. The visitors struggled to muster up a clear-cut chance on goal. In one of the few chances in the second half, an Oakleigh cross to Liam Boland threatened Paco keeper Pavlidis, but sailed just inches wide of the crossbar. Oakleigh will be feeling a sense of déjà vu after losing in a similar fashion to the reverse fixture last season. Ferrante Vitale’s men were able to frustrate and limit the high flyers with their industry and neat interchange, seeing off the Miron Bleiberg and his chargers.